If you have a home, you need a tool kit. It's an essential for any household. But what to put in it? There are so many different jobs around the home that require a power drill, so your frugal tool kit should include one. If you want to save the most money and have something much more handy, go with a cordless drill. They don't have as much power as an equivalently-priced corded drill, but for everyday needs, they're just fine. Ideally, get a good, refurbished brand rather than a cheap new one. DeWalt or Makita are reliable, and will last you many years. This will definitely be the most expensive tool you buy in this kit, but it's worth it. You will also need a variety of drill bits. Luckily, many drills come with a starter selection. There are several types of hammer available to the DIY enthusiast. A ball peen hammer, a tack hammer, a club hammer, and even a sledgehammer. But for the basic, frugal tool kit, your best bet is a claw hammer. Its two uses, driving in and removing nails, are ideal. When you get into more specific tasks, other hammers for specific jobs are much better, but for a starter kit, the basic claw hammer is just fine. The key word here is adjustable. As you're building a frugal tool kit, you want your tools to have as many uses as possible, whenever possible. The adjustable wrench can fit a wide variety of nuts and bolts, and is therefore perfect for your kit. Buy a wrench that is big enough to cover a large array of sizes, without being so big that it will be cumbersome on smaller nuts and bolts. Anywhere from eight to 12 inches is good. You probably know this as the Stanley Measuring Tape, but they are available from many different manufacturers. However, Stanley has been making these for decades, and they're very good at it. In particular, the PowerLock model is a great tape measure for having around the house. They're available in many different sizes, but for the minimal price difference, go for the 25'x1" model. It's sturdy, long enough to cover most jobs, and very reliable. Again, there are so many different types of pliers available on the market, all doing slightly different jobs. For the frugal starter kit, you are better off going with a pair of sturdy needle-nose pliers. We're looking for tools with more than one function, and these include a wire-stripping tool whilst also having a long reach and the ability to twist small wires and objects. When you start building up your kit, you can add locking and adjustable pliers. But for the basic kit, these will serve you well. Stanley's eight-inch long nose pliers are solid, and usually sell for under $10. Just like the tape measure, Stanley has also become synonymous with the utility knife. In fact, many professionals and amateurs still refer to it as the Stanley Knife. You will need a sharp knife for a countless array of DIY jobs, whether it's cutting carpet or vinyl tile, to wallpaper, wood veneer, or even sharpening a pencil. With a good retractable knife, you have safety as well as versatility, with a variety of different blades on the market available. There will be more than a few DIY experts screaming "No!" at this next statement, and I would usually concur — but this is a frugal toolkit, after all. Instead of buying a wood saw and a hacksaw, simply buy the hacksaw and use it for both purposes. There. I said it. If you only have the money for one saw, a hacksaw is at least multi-functional. It cuts through metal and plastic beautifully. It can also cut wood, although it's inefficient, slow, and clogs the small teeth — but, it will do it. Try cutting metal with a wood saw and see how far you get. There are several different blades available, so if you do need to cut wood, opt for blades with the fewer teeth per inch. For instance, 14 will perform way better than 32. For so many jobs around the house, you will need to make sure something is straight, or level. This is why a level is an essential part of your toolkit. They come in various sizes, from as small as three inches, all the way up to several feet. For your purposes, anything from nine inches to three feet is a good bet. Make sure your level has three different bubbles inside, for vertical, horizontal, and 45 degrees. If you really don't want to spring for a level, and have a smartphone, you can find an assortment of free level apps. The phone is not as good, but it's better than nothing at all. Finally, the flashlight. When the lights go out, or the fuses blow, you'll need a flashlight. When there's a leak in the corner of the basement, you'll need a flashlight. When there's a wiring issue under the counter, you'll need a flashlight. Basically, without a flashlight, you'll be groping around in the dark, and that's not safe at all. Now, regular flashlights are fine, but most people will tell you — the batteries die at the worst possible time. So, go with a rechargeable one. They stay plugged in, and are ready to go whenever. Plus, they're affordable, starting at around $10. 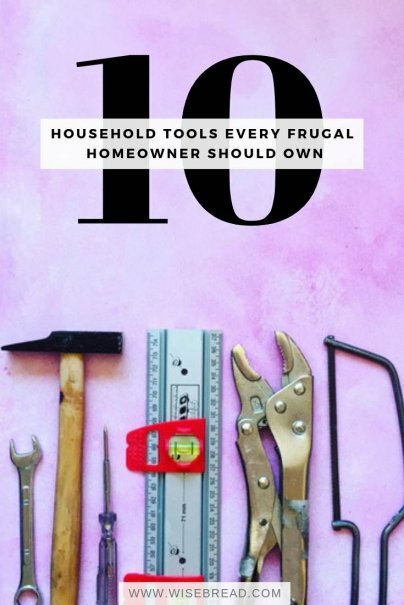 What would you include in a basic frugal tool kit? I take issue with the cordless drill recommendation. Unless you plan on using the drill frequently you will always have a dead battery or the battery will wear out due to age with very little use. Get a corded drill they are cheaper and always ready to use when the opportunity presents itself. Who wants to wait an hour for a battery to charge when you only have an hour to do the repair. My feelings exactly - I've had enough of dead cordless drills and "fully charged" batteries dying out in 5 minutes. I would also add a good circular saw to this list.